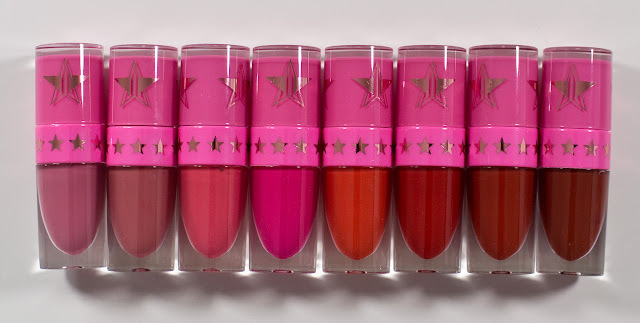 Jeffree Star The Mini Velour Liquid Lipsticks Reds & Pinks in Doll Parts, Calabasas, Wifey, Watermelon Soda, Anna Nicole, Prom Night, Redrum, & Unicorn Blood. The Jeffree Star Velour Liquid Lipstick retails for $18US for 0.19 oz of product. These Mini Velour Liquid Lipsticks Reds & Pinks retails for $52US for 8 X 0.07 oz of product which is just a little less than half the size of the full liquid lipsticks each. 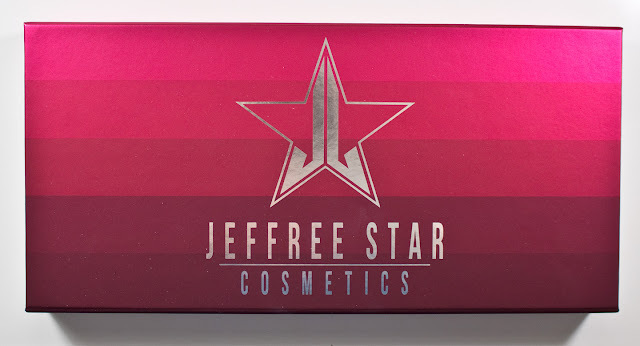 Jeffree Star The Mini Velour Liquid Lipsticks Reds & Pinks box bottom with ingredients. Jeffree Star The Mini Velour Liquid Lipsticks Reds & Pinks box opening flap. 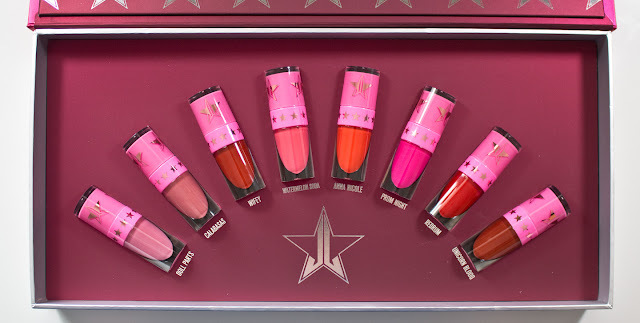 Jeffree Star The Mini Velour Liquid Lipsticks in Doll Parts, Calabasas, Watermelon Soda, Prom Night, Anna Nicole, Redrum, Wifey, & Unicorn Blood. 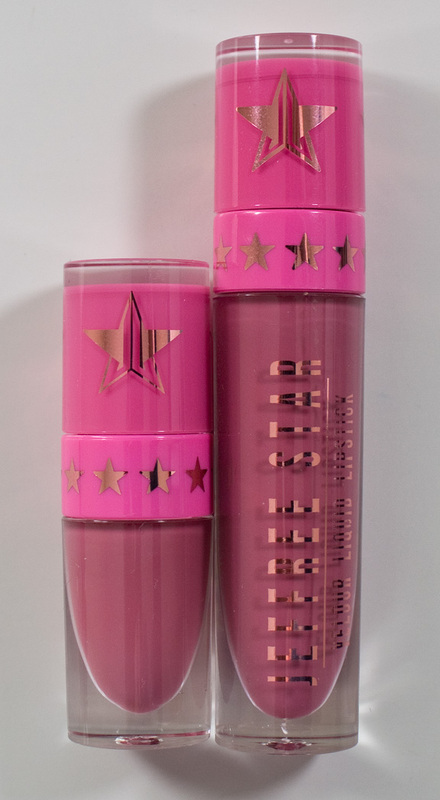 Jeffree Star Velour Liquid Lipsticks in Mini and Full-Size Doll Parts. The formula for the shades in this kit is the new formula, they are on the thinner side but not too sheer. It only needed one coat to get full coverage on the lips. The shade Unicorn blood was the only shade with the new scent of candied mint with vanilla that it is rather subtle. Watermelon Soda did smell like candies watermelon Jolly Ranchers but it is a subtle scent. Doll Parts is a soft cool pink is a bright mauve with a matte finish. Calabasas is a dusty cranberry with a matte finish. Wifey is a brick red with a matte finish. Watermelon Soda is a bright coral pink with a matte finish. This one is semi-opaque. Anna Nicole is a bright orange-red with a matte finish. Prom Night is a bright pink with a matte finish. This one is semi-opaque. Redrum is a true red with a blue base with a matte finish. Unicorn Blood is a brown based blood red with a matte finish. This one is semi-opaque. Wear: For about 8-10 hours before needing a touch-up. They also wear down with dignity. Clear tube with a small doe foot applicator, the doe foot is larger with a curved inwards shape to hug the lip comes to a rounded tip. The mini version is just slightly smaller and less fluffy compared to the full-size applicator. The tubes of the mini are shorter by a little more than half, and the cap and tube topper is the same. The box they come in is huge for the products in it and has a magnetic closure. I wish the foam tray that housed the lipsticks came out to make the box reusable, but it's glued in. The finish of the box is cool.... it a metal silver foil with rubberised shades of red and pink printed over it. 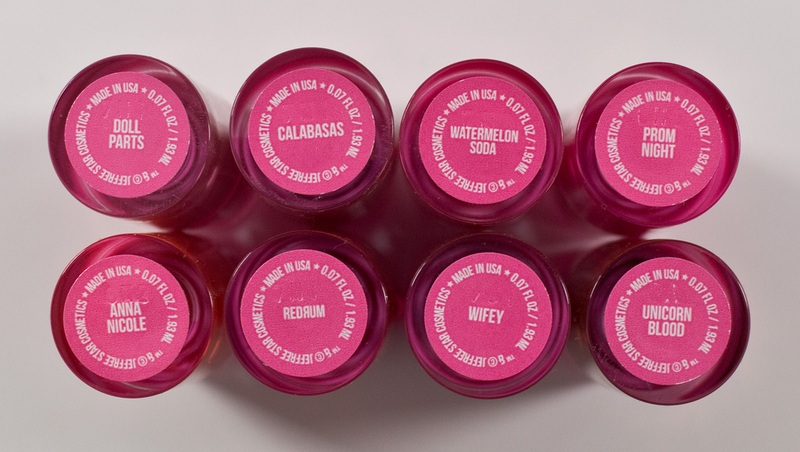 Daylight swatches: Doll Parts, Calabasas, Watermelon Soda, Prom Night, Anna Nicole, Redrum, Wifey, & Unicorn Blood. Flash swatches: Doll Parts, Calabasas, Watermelon Soda, Prom Night, Anna Nicole, Redrum, Wifey, & Unicorn Blood.